Among the many opportunities Hainan seized over the past five years, two stand out most, Governor Jiang Dingzhi said on Jan 27 at the annual session of the Hainan provincial people’s congress. "First, the establishment of the province as an international tourist island was upgraded to a national strategy," he said. "And the State Council approved construction of the all-new city of Sansha last June while providing strong financial support as well as many preferential policies," he added. "It will be the country’s southernmost city on the South China Sea." 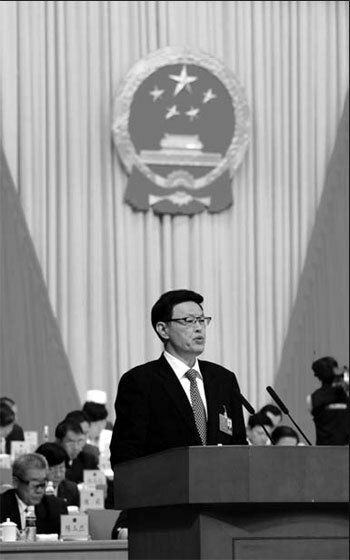 The province has made remarkable achievements in both economic and social development since 2007, said Jiang. Last year, Hainan’s GDP surpassed 285 billion yuan ($45.7 billion), an 11.8 percent increase over 2011. Investment in fixed assets exceeded 214 billion yuan, four times that in 2007. "The provincial government has compiled a series of regulations and guidelines involved in the integrative development of urban and rural areas, the construction of 10 industry parks and the price management of tickets to tourist destinations," he noted. The authorities have granted visa-free entries to people from 26 countries. Large duty-free stores in Haikou and Sanya add to the allure of the province. In addition, the traffic has become more convenient, he said. Some 130 kilometers of expressways, 308 km high-speed railways, 120 new air routes as well as four large ports were built or opened during the past five years to accommodate more domestic and overseas tourists. Construction will begin on an airport at the coastal town of Boao this year. It is expected to be fully operational by the end of 2015, the governor said. A group of key infrastructure projects are also under construction including a crude oil loading terminal, a liquefied natural gas station, a nuclear power plant and a water conservancy hub. At the same time, the province’s financial sector is also growing, with seven local companies listed on the stock market and 41 rural financial institutes established. Hainan’s booming industries have attracted the Asia Financial Cooperation Association to settle on the island, while nine financial institutions have set up subsidiaries. As well, the provincial government has carried out a series of reforms on taxation, logistics, medical services and burial customs. In the five years, the province received nearly $7 billion in foreign investment, and had $57 billion worth of exports and imports. It also participated in regional trade in the China-ASEAN Free Trade Area, continued to deepen communication with Hong Kong, Macao and Taiwan, and established cooperation with 15 Chinese ministries and 23 State-owned companies. A batch of international events were also held on the tropical island, including the Boao Forum for Asia, BRICS Leaders Meeting, the Third Roundtable Conference on China-Africa Cooperation and Tour of Hainan Island Cycling Race. The quality of life for locals also improved during the five years. More 460,000 low-rent apartments were built while personal income in both urban and rural areas grew at double-digit rates. The local governments offered 460,000 job positions, trained 380,000 rural residents and laid-off employees, and reduced the urban unemployed rate to under 4 percent, he added.